Arduino Controlled Trainable Robotic Arm « Adafruit Industries – Makers, hackers, artists, designers and engineers! Inspired by the Baxter robot, this arm can be trained to move with your own hands. Once the train button is pressed, you move the arm and gripper as needed while the Arduino stores the positions in EEPROM. After that the arm will replay the motion as needed. It looks like a micro servo, it acts like a micro servo, but it’s more than just a micro servo! 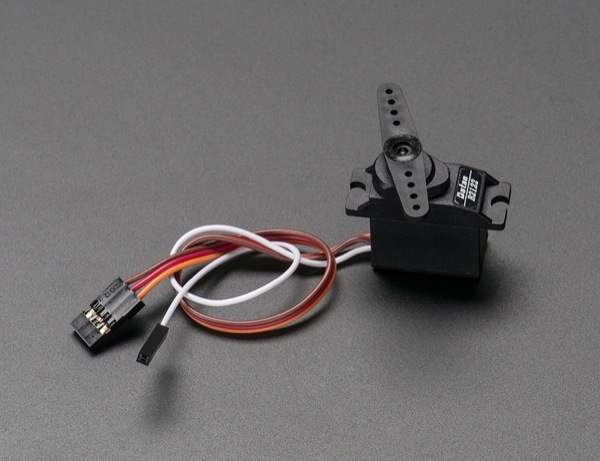 We got a factory to custom-make these quality metal-geared ‘micro’ sized hobby servos with a twist – the feedback (potentiometer wiper) line is brought out to a fourth white wire. You can read this wire with an analog input such as those on an Arduino, to get the servo’s position. That information can be used in robotics to improve stability or even allow ‘recording’ of servo motion.